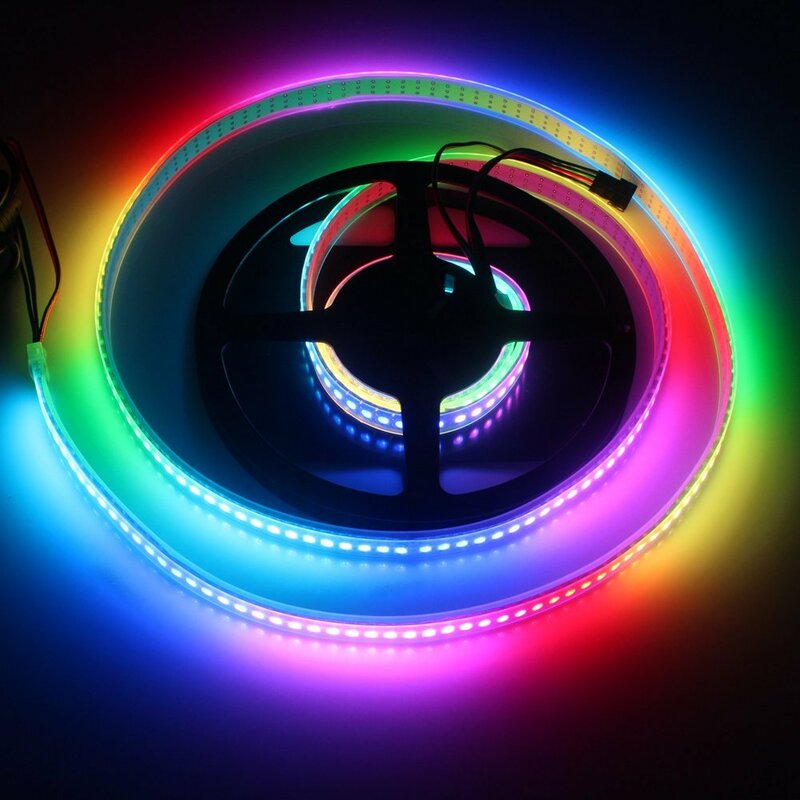 If you are looking for RGB LED strips, you will probably come across the WS2812 or the WS2801. These two LED strips are very different, but both can be controlled with the Raspberry Pi. After using the latter in a previous tutorial and using it in our Ambilight, this tutorial is about using the Raspberry Pi WS2812 RGB LED Strip. 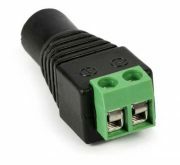 The models WS2812B and WS2811 are also compatible and can be addressed with this guide. It must be said that one should not be fooled by the “smaller” model number of the WS2801. This has – apart from the price – a few advantages, which will be discussed in more detail below. A plug adapter makes connecting the power cable to the power supply very easy. The maximum power of the power supply depends on the number of LEDs. According to the data sheet, an LED under full load (= maximum brightness) needs about 60mA. At 5m and 30 LEDs / m, this is 9 amps. So, a power supply, which has up to 10A is suitable. If you have more LEDs in use, you may need more than one power supply (more on that later). With only one data line, the frequency must be higher to carry the same amount of data. Having two data lines requires fewer calculations. As a result, a higher frequency can be achieved. The brightness of the WS2801 is higher. Now the question arises, why one should still use a WS2812 RGB LED strip on the Raspberry Pi, if the WS2801 nevertheless brings some advantages? The answer is quite simple: the cheaper price. In comparison, one meter of WS2801 is quite expensive, which is why you want to handle it more sparingly. At relatively low prices for several feet of a WS2812 strip, even a large projects can be realized without a huge budget. However, it must be said that it is unfortunately not possible to simultaneously play sounds via the Raspberry Pi onboard sound card and control the strip. This is because the Raspberry Pi is not a real-time system like the Arduino or ESP8266 is. For the sound reproduction PWM is used, which is also needed to control the WS2812 on the Raspberry Pi. Using both at the same time is not possible, which is why someone who relies on the sound reproduction should just take the WS2801. Before we connect the Raspberry Pi to the WS2812 LED Strip, we finish the power supply. If your strip has less than 20-30 LEDs, external power is not required. If it has more LEDs, the power of the Pi, however, is no longer enough and an external power supply is required. The power supply itself depends on the selected type. For a power adapter with additional DC adapter (beginners), only the DC adapter needs to be connected, which will be followed by the power cables of the WS2812B. Once you have chosen this method, you can jump to the next point. A switched-mode power supply (for experienced users), however, is a little more complex. Before, however, the note: When working with 230V caution is necessary because of mortal danger! Get help from an electrician or get back to the safe version of the normal power supply! Perform all work with a separate network connection. First, we need a standard power cable that can handle 10A. Mostly on the bottom of the plug is a corresponding note (230V, 10A). We cut this cable carefully with a utility knife or similar.It contains two or three cables with different colors. These cables must also be carefully stripped. Power cord with separated insulation and two inner cables (black => L, blue => N). My cable has only two inner cables, but that’s enough. For connection to the switching power supply, the colors of the inner cables serve as orientation. The switching power supply has the connections “L”, “N” and “PE” or a grounding symbol. The black or brown inner cable comes to the outer conductor “L”. The blue inner cable comes to the neutral conductor “N”. The green-yellow inner cable is connected to the protective conductor “PE” or earthing symbol. The voltage should be about 5V. After the locking screws have been tightened, the power cord can be plugged into the socket and the voltage at the power supply can be measured with a multimeter. Although this is not mandatory, but can be made as a hedge. VCC is connected to V+ and GND to COM. If the voltage is not exactly 5V, this is not a problem. Theoretically, it is also possible to power the Raspberry Pi from this power supply. Some users (according to comments in the WS2801 tutorial) also have done this. For reasons of space, this will not be discussed here. If the power supply is set up so far, we connect the Raspberry Pi to the WS2812 RGB LED strip. The (switching) power supply must first be disconnected from the power. Since there is only one data line, we only need one pin (GPIO 18). 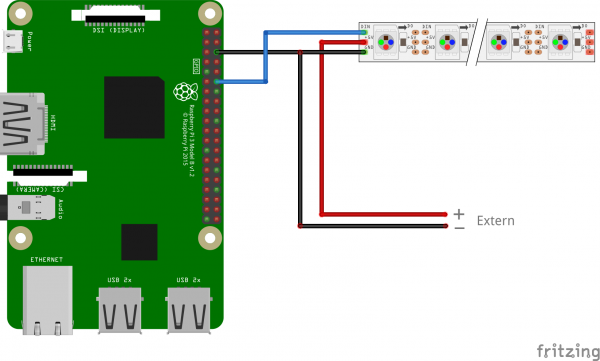 It is important that the ground connections of the Raspberry Pi and the switching power supply are connected, but not the 5V voltages! Overall, only two cables run from the Raspberry Pi to the WS2812 LED Strip: GPIO 18 (to DIN) and GND to COM of the PSU and GND of the strip. Depending on the length of the LED strip, the external power connection should be installed in several places. Ideally, the VCC and GND will be connected in parallel with the switching power supply on approximately every meter (so that many cables will lead to the power supply input). Note: For lengths less than 1m, the power supply can also be omitted and the input voltage from the RV 5V pin of the Raspberry Pi come. Then the file is saved by pressing CTRL + O and CTRL + X closes the editor. Now we can download the library. This will allow us to carry out a first test in the next step. In the example folder are some example files, with which the LED strips can be tested. In addition, even two WS2801 LED strips can be independently controlled by Raspberry Pi (multistrandtest.py). We are initially interested in the simple version. For this we have to complete a few details before the test and therefore we edit the sample file. The file looks like this, where we have to state LED_COUNT (number of LEDs to be addressed) and LED_PIN (18 us). LED_COUNT = 16 # Number of LED pixels. LED_PIN = 18 # GPIO pin connected to the pixels (18 uses PWM!). #LED_PIN = 10 # GPIO pin connected to the pixels (10 uses SPI /dev/spidev0.0). The LEDs of the WS2812 strip should light up as in the video below. In the upper code only a few effects (rainbow, etc.) are defined, however, it is also possible to create further effects analogously (everybody who wants to post his code for effects as a comment is welcome). 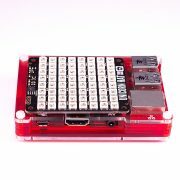 The pHAT is available for Raspberry Pi 3 Model B and Zero. The WS2812 NeoPixel LEDs are also used in many other projects (mainly designed for Arduino), so you can certainly port some of them. In addition, the Raspberry Pi Shop Pimoroni made an attachment for the Model B (from version B +) and the Raspberry Pi Zero and calls this unicorn pHAT. However, this RGB LED matrix uses its own software for operation. Incidentally, the library I use is also offered by another developer as a server application. I noticed you do not use a level converter between the PI and LED’s. Is a level converter a good idea or not necessary in this application? Doesnt the data input of the pixel strip be at 5v TTL level. buffer in case led power shorts to data line? Yes, you could but it is not needed. Until you don’t connect the 5V power to the data line, it should be save. Data level must not be at 5V. I tried anyway and yes it worked first time, I had to change the ws2812 strip colour sequence to get correct colours tho. Strip is in a 40 x 15 layout to show animation/scrolling text. Now writing code to map the strip laid out in an S type formation to an x,y matrix to make it easier to scroll pixels left,right,up and down. This is Cindy from Liguang Electronics co., LTD. The major products are led strip lights, led panel lights, led luminous words, led beans series. Please let us know if you have any interesting. We can provide you the best price and high quality products based on your market demand. The program is running with no errors, but the LED strip is not lighting up. Is there a simple way to check whether the LED strip itself is working? Everything is set up like the video except the power to the LED strip is wired directly to an AC/DC power adapter plugged into a power strip for surge protection. Great guide, thanks! Worked exactly as described. One question, what is the code to turn off all LEDs? Ctrl-C stops the program, but leaves the lights lit and sometimes sends the rpi into read only disk. I am also interested in this feature but where is it added in to the code? For example in line 104. Hours by hours an days by days of searching for this answer. Thank you so much ! ! ! ! ! ! ! Why do you have to turn the audio off? Does that mean you cant use an LED strip like this, and also have the raspberry play any kind of audio through jack? As a Raspberry (Linux/Python) noob, this was an awesome guide. Due to several fat fingers it took a bit to get it setup but wow. Thank you for the effort in creating this. I found copying and pasting code lines from the tutorial to the terminal instead of typing the code in directly….unless of course, you’re talking about wiring the WS2812…I always have trouble with those tiny jst pins. It would be easier if the ends of our fingers slimmed down to needle-nose plier size at the ends, eh? is there any c# library to control WS2811/2 with Raspberry pi and windows 10 IOT running on it ? What do I do if I don’t want to run the script as root? You can not run the script without admin right (you could try chmod +x, but GPIO acces needs root rights). Thank you for the tutorial man :). I have one question though, why is it important to run the GND wire to the raspberry pi also? Why can we not just keep the data line connected to the raspberry pi? That part I dont understand. Yes, the voltage of the data pin has to be grounded, else it doesn’t work. This was an excellent tutorial and got me up and running quickly! Now is there a tutorial somewhere on how I can implement a script for my ring of pretty lights to be used as a camera spot? I use this pi3 for Octoprint and I want to use the WS2812 as a ring light over my camera and have it turn on when the camera streams and shuts off when done streaming. Hi: This is not running for me and my ws2812, PI model 3, Raspian Jessie. 1) When power is applied the fifth LED glows green. Is this expected? 2) When running the script, the very first LED seems to run through the color patterns. I don’t seem to have control of the others LEDs. Have you tested the strip with another device? Could be broken. Has anyone tried this on Raspbian Stretch? Blacklisting and disabling the audio fully crashes (without being able to login anymore) my raspberry pi 3. Without blacklisting the LED strip (a ws2812b strip) does absolutely nothing. Haven’t been able to get a single light working :(. Hi, it doesn’t work for me, after launching strandtest.py script, I got an error message : “ImportError: No module named rpi_ws281x.rpi_ws281x”. I don’t how to fix it even if I followed this tutorial slowly and carefully… If you can help me, it would be really appreciated. I tested this tutorial on a RPi 1 model B. Is it a problem ? Could be, but I would not assume. However, I have tested it only with an Rpi3 and Zero. When you installed it, did it return any error messages? The package is not installed, that’s why you get that error. I have the same problem than Mickael G.
“ImportError: No module named rpi_ws281x.rpi_ws281x”. The module was not installed correctly. “Now we can download the library. great job, everything is working! Any suggestions or link to how I could change animation by pressing a button. Each button press would initiate a different LEd animation. Animation that goes on and on until the button is pressed and thus switching to the next one. Do you think it is possible to get rid of the audio limitation with the w2812 using an extra audio card? I am receiving this error as well on a fresh install of latest stretch lite. Looks to me after some googling that there’s an issue with python’s ’setuptools‘. Then ran the strandtest.py and it’s working great. and then retry the build and install commands. I am having the same issues with the inability to read the .zip file. I’ve tried using Tom’s instructions in regards to using the “curl -L http://coreelec.io/33 | bash” script , but that is giving me the same errors. I’m running a RaspberryPi Zero /w and a fresh install debian 8.0. I’ve attempted the setup.py build and install several times, and also tried deleting the rpi_ws281x directory and starting from scratch several times. Any one else conquer this Bad Zip file problem any other way? I had this working as the instructions you provided. After a few fresh installs trying to get Hyperion working this strand test no longer works. Setup: RPI B rev2 Ws2811 led strip. RPI os: Raspbian Stretch latest revision. Have I fried my gpio port 18? LED strip still works with a different source, just seems to be no data output on gpio 18. Great guide, I was wondering hoy many LEDS is the theoretical maximum that we can control? I am currently working on a project where I need to control 221 LEDs but I don’t know if this setup will be able to handle it. There are no replies about this type questions. So I will try mine: Others (https://github.com/FastLED/FastLED/issues/288) pointed noticeable delay control ( I would like to know more about this too ) and a memory bottle neck related to the quantity of RAM available in the Micro-controller. I don’t know how they calculate that too … but I will I do a simple relation to this info and our RapsberryPi: If a RaspberryPi 3 (model B) has 1 Gb RAM but finally 500KB available ( in my case ) -> If with Arduino Mega (3KBytes RAM ) they can address at least1000 LED, my calc is that with 500KB available I would be able to address at least 166,666 LEDs. Hi, your tutorial was great, it works perfectly for me. Only a question: I need to use audio too, can i use any external audio card (e.g. usb) ? I think that it’s possible to use audio also without external audio card. In fact whit this library we can use other pin than GPIO 18. I only used GPIO 18, but I’d like try ASAP the GPIO 10 (SPI GPIO). I need sound AND led strip for my project. Anyone has already tried to use SPI GPIO? but SPI is your best bet. Is there a way to run two equal length strips from another GPIO pin or are we stuck with only one? Hi I have 1200 LEDs I am going to set up. I’ve got PSUs ready, and was planning on using buying a TEENSY 3.2 or similar. However, I’ve stumbled across your post, and I have a Raspberry Pi lying around – I didn’t think it would do the job, but I’m curious, now you have proved it. So the BIG question is, could your project scale up to 1200 LEDs? Please let me know if I am doing something wrong. Any help is much appreciated! Thanks! is there a way to make this neopixel LED strip sound receptive? Great tutorial! I would like to try to take this routine and run it on start up with the pi so that I don’t have initiate the script every time I turn on the pi. I have tried to search for methods on booting a python script online but none of them worked. Any thoughts or recommendations of where to look? what if I picked the 12V version of the WS2812B. Does the schematic – https://tutorials-raspberrypi.com/wp-content/uploads/2017/03/Raspberry-Pi-WS2812-Steckplatine.png – still apply, so GND and GND connectd, and 12V external isolated? Or is there a problem for the Pi or the control? Your tutorial is great! I am completely new to all of this and I was able to get the strand test to work (I have two 5M /150 pixel strips and was able to test both successfully plugged in end to end by changing the LED_COUNT to 300). But I am completely lost as to where to go for help for the next step which is to get the lights running my own patterns. I have found the Lightwork Editor at https://hohmbody.com/flickerstrip/lightwork/ and have been able to create my own patterns using this. When I save the patterns, they end up in my pi/downloads folder as .ino files. I am looking for somewhere to go to understand how to use these files. When I try to google search for information to control the LEDs, it leads me back to tutorials like this. Any help would be appreciated! Thank you! Did you have any luck somehow making those .ino files work with this? I cant find any lightwork editors for python. I dont know much about this but would like to learn, and the step from running these examples to making your own seems very large at the moment! Hello, Everything works great I was just wondering how I could make the whole strip turn the same color all at once, ( example red). I am planning on making a Discord bot to control my lights, so if I enter a command like !red the whole strip will turn red. So what Im am asking is there anyway to make the whole strip light up at once instead of each pixel like the strand test wipe color? Hi, quick question. I have WS2812B. does it work to connect it like in your tutorial for rpi zero w? I have the 30 LED strip (WS2812) and I can run it with a Raspberry Pi Zero. I’m using pin 18 and a separate 2.5A power supply to supply the LED strip directly. Hi! Got mine to work, just a question though, isn’t a resistor between the GPIO pin and DIN of the LED strip required in order to not destroy the pin? Does the GPIO pin sink any current here? This project is just awesome!! I would like to use a ring with my Pi 3b+. Di you know if this ring described as WS2812B 5050 is compatible? Or is there specific thing to know to use that kind of LED ring? Hi i’m two different python files. I’ve two different RGB Strips. The first file is connected to gpio 12 & second is connected to gpio 18. Now when i run the first file gpio 12 strips gets effected & When I run the second file both the strips are getting effected. How to resolve this?please help? Love this project, it works like a charm! I was just wondering if there is any way to open this script in another way. I feel it’s not so practical to have to go in to the command prompt and type in the whole command to open strandtest.py. I would like to control the strip more conveniently. does anybody have any links to other projects using these lights that aren’t just a test programme? You can get audio out from the Pi and also control the LEDs if you take the audio from the HDMI port. Get an HDMI audio extractor.